As I was working through the post and taxonomy chapter in Professional WordPress Plugin Development and checking out the new post formats feature for WordPress, a light bulb turned on in my head. I wanted to change how we think about news themes. One of the things I hate the most about news or magazine themes for WordPress are their extensive options pages to handle the front page of the site. I’ve always thought this could be more flexible and more intuitive for the end user. 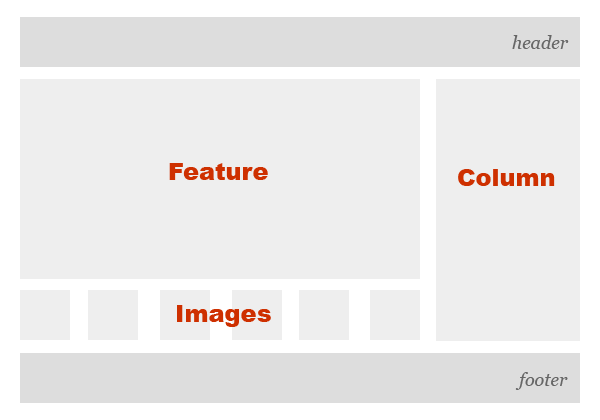 The idea is to use a custom taxonomy to handle the display of things on the front page of the site. Before getting any deeper into this subject, take a look at the following image. It is an example of what the front page of a news theme might look like. I’ll use this as an example throughout the rest of the article. In the image from the previous section, there are three front page areas: feature, images, and column. Generally, news themes have a settings page that allows you to select a category to display posts in specific areas on the front page. So, you would most likely select a category for each of those sections. What this means is that you typically have to create a “feature” category to handle your featured posts and maybe even create new categories for the other sections. Other themes just have variations of this basic idea. This is poor design and doesn’t make for a great user experience. It doesn’t put the power in the user’s hands. Rather than having a settings page to control which categories and so on fit within certain blocks on the front page, consider using a custom taxonomy. This way, the user can select where a post would appear while writing the post itself. This seems to make more sense from the user’s perspective. And, it doesn’t force users to use categories to determine how their site content is displayed. The following screenshot is an example of what this could look like on the post editing screen. 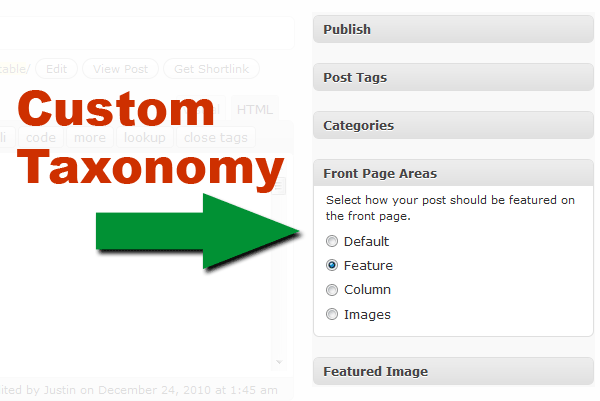 You could even make this custom taxonomy public, allowing for featured post archives, nav menu items, and so on. There’s plenty of room for innovation in this area. If you’re an end user, does this type of system make more sense to you? Or, do you prefer a theme settings page in which you must select a specific category to handle the display of the front page? As a theme developer, do you think this system would work better? If so, what types of areas do you think would be standard in news themes (I’d like to come up with a good default list)? I welcome alternative ideas too. I haven’t seen a whole lot of innovation in this area in the past couple of years.